Is there any food that brings out your inner kid faster than a donut? Just a glimpse of the blue-and-white paper Westco bag sends me hurdling back to early morning road trips, campfire-smoke drenched pajama parties and bleary-eyed bumbling down from camper bunk-beds. So, as National Donut Day rolls around, you might be facing a bit of a dilemma. Do you mark the day and indulge your inner child with a deep-fried, succulently-sugary nostalgic nosh? Or do you focus on your future health and hold off? Well, what if I told you there might be a third option that gets you out of this sweetly-sticky predicament? You can have your (round and hole-y) cake and eat it, too, if you ditch the store-bought, super-processed donuts and make your own grown-up, healthier version! Liking the idea of this loophole (or should I say donut hole)? Then I’ve got the tools you need to hop on through! I’ve scoured the recipe archives of all the best healthy chefs and scrounged up 40 of the healthiest donuts to make both your inner child and your future health happy! 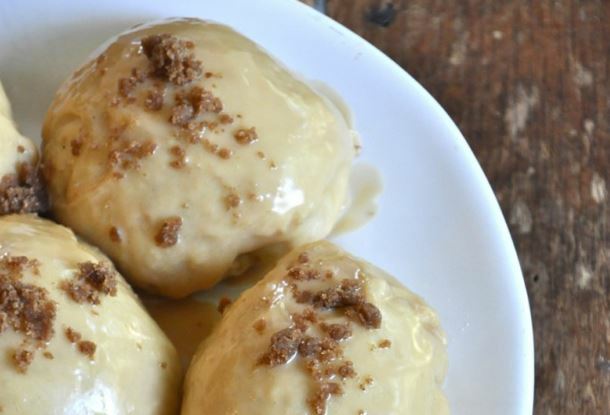 Each of the following recipes is 100% a healthier twist on traditional deep-fried donuts! All of them are baked (or in a few tricky cases, raw!). This eliminates all the extra fat and carcinogens that embed themselves in the donut during the frying process! The actual ingredients of the donuts vary from still pretty processed to 100% whole foods. 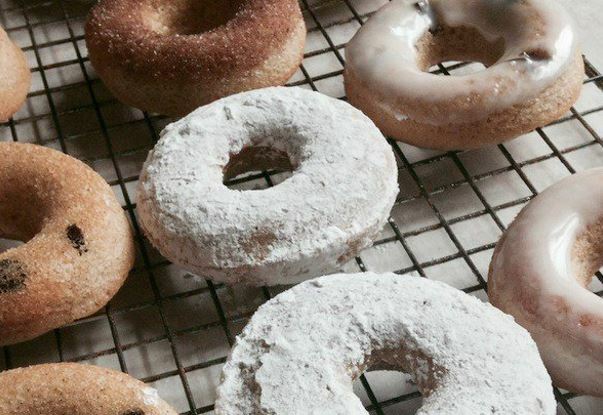 To help you pick a recipe that strikes the perfect balance between traditional donut flavors and health for you, we’ve added a little rating for each. A health rating of 1 means the donut is healthier than store-bought options, but still pretty processed. A 3 means it’s mostly healthy, but not perfect. A 5 means the donut is a straight-out health food! Keep in mind, you can always tweak these recipes to up their healthfulness! Ditch the glaze(s), replace refined sugars with fruit or date sugar, swap in flax seeds for eggs or replace oil with applesauce! Don’t forget to let us know which one you enjoyed or tried out! For those of you not into anything exotic or fancy in your donuts, let’s start with simple ol’ healthy sugar-glazed or plain donut recipes! 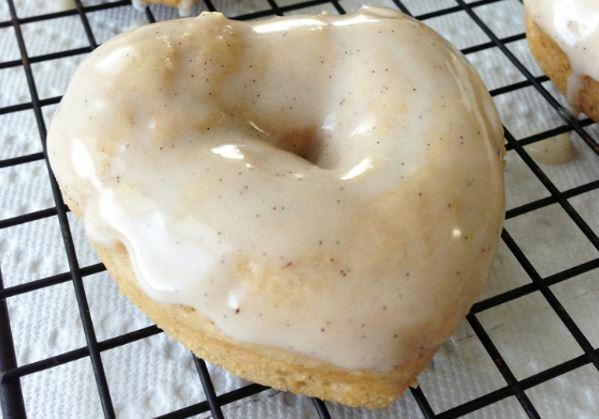 Topping our list is this simple donut recipe by Living Sweet Moments! By swapping out the full-calorie versions of traditional donut ingredients for healthier/lower-calorie options, this donut keeps all the flavors of a more standard donut, but ups the health factor. Opt for a healthy, fruit or nut-based topping and you can boost the nutritiousness yet further! If you’ve been living a vegan lifestyle for a while, you’re probably no stranger to vega-fying recipes! But why do the trial and error of veganizing a dish when Healthy Mummy put in the leg work for you? These simple donuts use coconut oil and apple cider vinegar rather than eggs and milk for moisture, making them instantly vegan! Add in coconut sugar rather than even more highly processed cane sugar and we’re sold! Vegan and gluten free? Tessa the Domestic Diva’s got you covered! 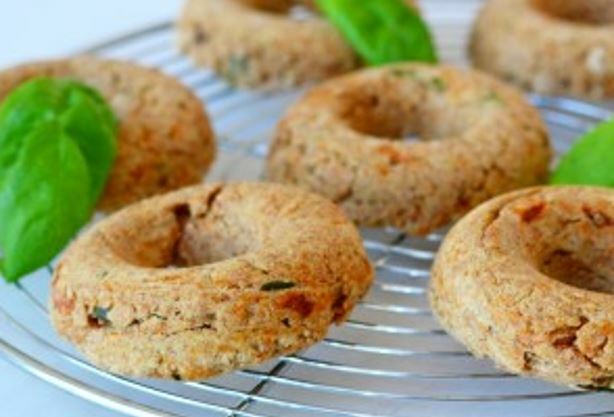 Swapping out wheat flour for a mixture of oat, rice and almond meal makes these simple animal-product-free donuts gluten-free as well! What’s more iconic that a simple, glazed Krispy Kreme donut? If hitting up your local Krispy Kreme is your go-to donut plan, then this is the recipe for you! This healthy Krispy Kreme recipe is unfried and has you glaze only half the donut, dropping the sugar and fat content! Plus, Chocolate Covered Katie gives you great tips for switching out sugars for healthier or lower-calorie options! But you’ll definitely still get all the sweet, gooey goodness of a traditional Krispy Kreme! Technically these aren’t plain donuts, I guess! They’re vanilla flavored. But I’d say just adding an extra dose of real vanilla bean keeps these decadent little donuts simple enough to be included here! 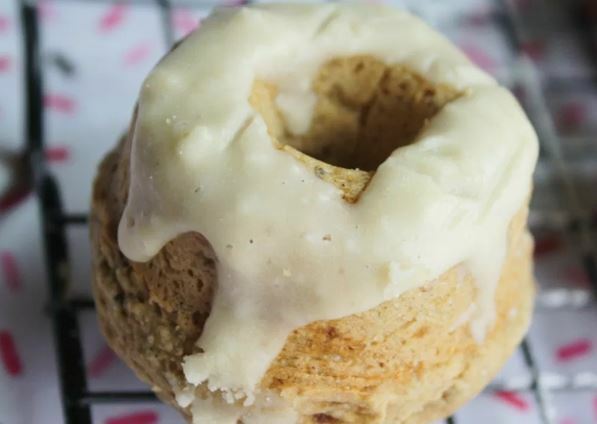 Using whole wheat flour, Greek yogurt in place of oil and fresh vanilla bean paste for a little flavor-umph, this recipe from Skinny Fork is a healthier and more flavorful take on the traditional plain donut! Any chocolate lover’s in the house? Welcome to your healthy donut heaven! 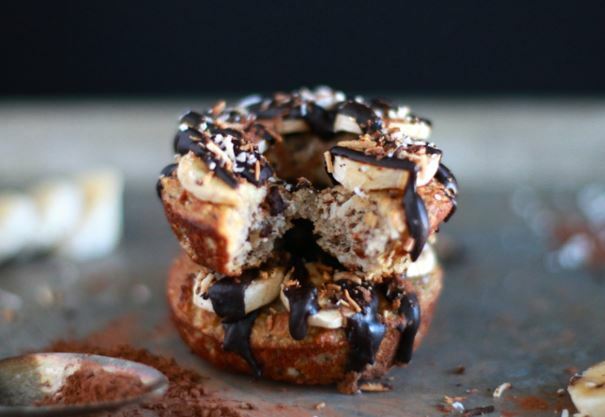 This decadent donut masterpiece by Nutrition in the Kitchen checks all the boxes for a healthy donut recipe. It uses almost entirely minimally processed, healthy ingredients. And it just packs in layer after layer of rich flavor: dark chocolate, banana, coconut, honey, almond meal, and vanilla. I mean, seriously! 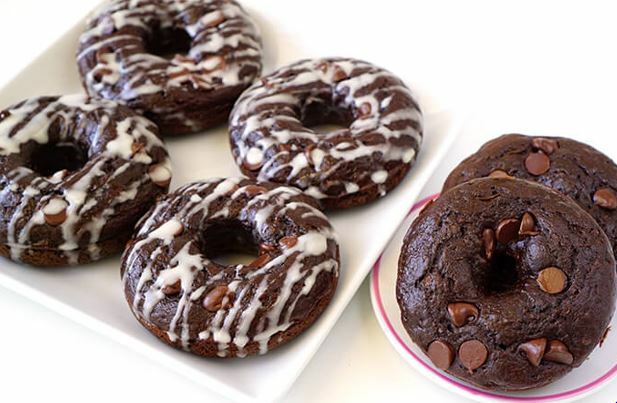 What more could a chocolate-loving-donut-fiend ask for! Is there a more classic combination than chocolate and peanut butter? This donut channels all the melt-in-your-mouth goodness of a Reese’s Peanut Butter Cup into a ring-shaped, less-guilt-ridden treat! 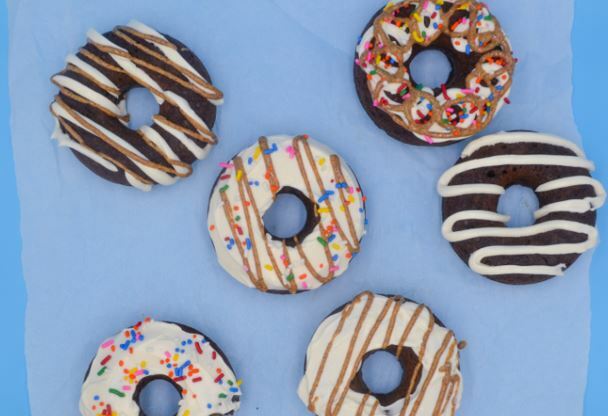 The donut part of this recipe by Amy’s Healthy Baking swaps the traditional white flour for whole wheat, opts for dark chocolate, replaces processed sugar for maple syrup, and drops processed oil in favor of Greek yogurt and skim milk for moisture. To top it off (literally), the glaze recipe uses nutty, nutrient-rich peanut butter and creamy Greek yogurt as a base, rather than the more common butter-confectioners-sugar combo! Like your chocolate to come with a bit of zing? 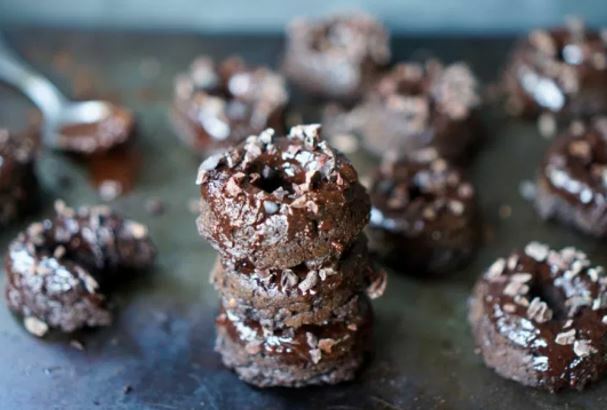 These healthy donuts by Craving Nature combine all the decadence of dark, raw cacao with the freshness and pep of peppermint extract for a zippy, Thin-Mint-like experience that is hard to resist. Don’t let the richness of these donuts trick you, though! Built on a base of oat flour, heart-healthy chia seeds, avocado, maple syrup and strongly brewed coffee, they are positively loaded with nutrients! Want to instantly up the health factor of your donut? Add in some veggies! 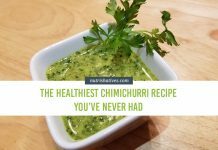 This creative recipe from Happiness is Homemade sneaks in a full cup of shredded zucchini, upping the fiber, vitamin C, folate, potassium and manganese content of donut without you tasting anything but chocolate-y goodness! 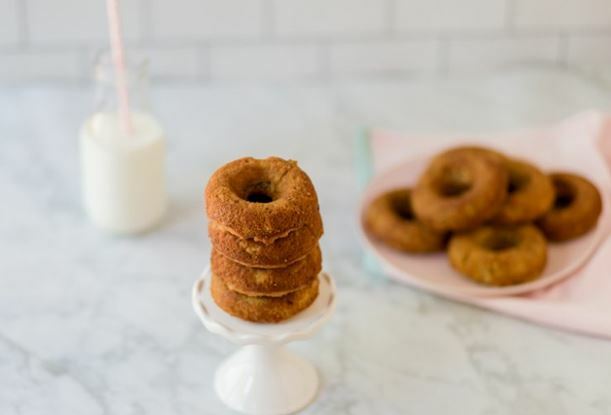 Combine this with the applesauce-oil swap and the lack of any refined sugars, these creative donuts shoot to the top of our healthy-donut-recipe list! 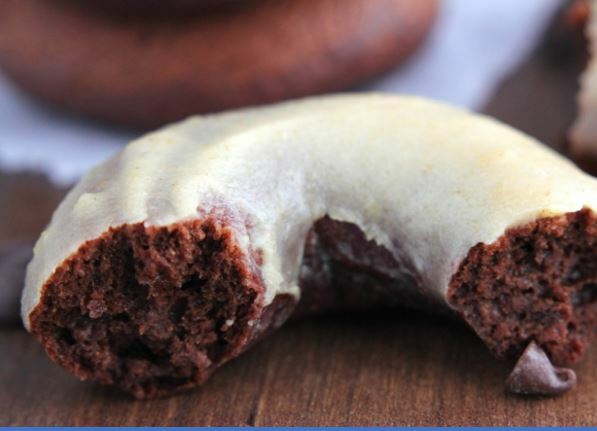 This recipe by Morgan Manages Mommyhood takes the concept from the Chocolate Zucchini Donuts to the next level! These Hidden Veggie Donuts call for three different kinds of fruits and veggies, in the form of either a puree or juice (though in quite a bit smaller volumes). While Morgan used more exotic plant foods, like beets, cherries and pomegranate, you can literally swap in any fruit or vegetable you like! If you’re a chocolate lover, chances are Nutella has a kryptonite-catnip-like power over you! Sweet, hazelnutty, chocolate-y — the stuff is seriously addicting. And happens to also be the perfect natural frosting for a simple, freshly-baked, homemade donut like the one in this recipe from Damn Delicious! The natural healthy fats of nuts make them a wonderful, creamy, nutrient-rich base for tasty baked treats! Here are my favorite from the world of donuts! 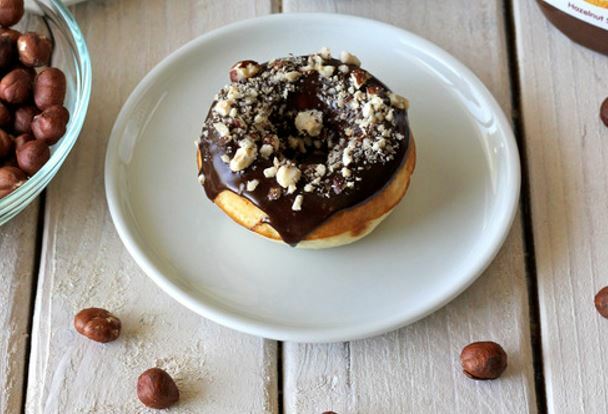 Chocolate Covered Katie does it again with this light, fluffy, nutty donut recipe! Spelt flour, almond butter, apple cider vinegar, vanilla and maple syrup combine to give you the perfect balance of sweet, rich, almondy and healthy! For this recipe from Odd Bake, the whole kit and caboodle is nutty! The almond flour-based batter infuses each bite with a light nutty flavor (and makes the recipe naturally paleo-friendly, to boot!) Then the whole thing is then smothered in a cashew-butter-cinnamon-honey glaze! What more could a nut-lover ask for? I don’t know if it’s the uniquely smooth flavor or the fun green color, but I’m a total sucker for pistachios! And that makes me a total sucker for these donuts from Well Plated! 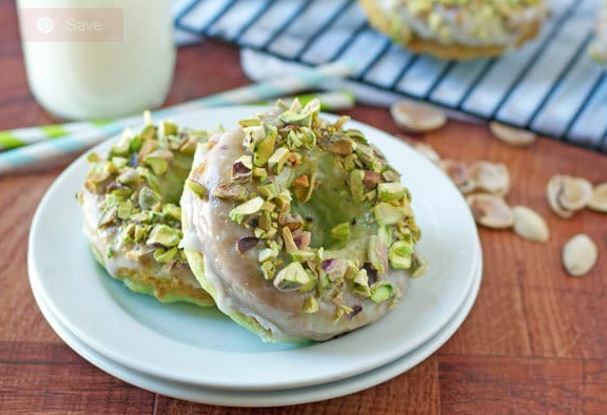 The donut itself is a simple, plain home-baked delight, but it’s drenched in two layers of pistachio! First, a glaze of pistachio pudding, then a coating of freshly-crushed pistachios! Sugar and spice and everything nice, that’s what these donuts are made of! If you love warm, vibrant or oriental flavors, this is the section for you! Cinnamon right in the name is always a good sign! Warm and fragrant, cinnamon takes the flavor of any dessert up a notch! Plus, it offers a kick of healthy antioxidants and phytonutrients — a win-win situation for your taste-buds and your cellular health! And this simple donut recipe from the Food Network gives you a cinnamon double-whammy, combining cinnamon-infused batter with a cinnamon-sugar coating. Like the concept of a cinnamon donut, but looking for something with minimal processed sugar? 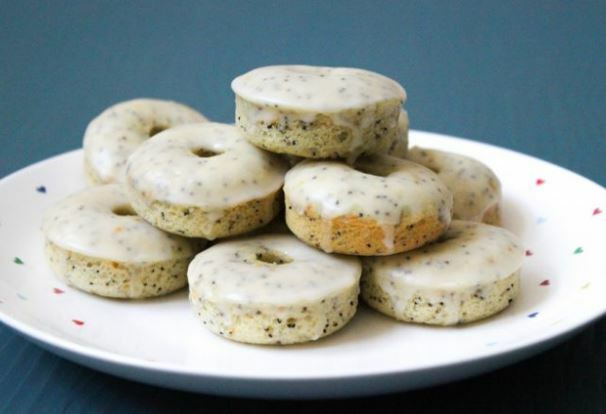 Forest and Fauna’s got you covered with this low-carb donut recipe! 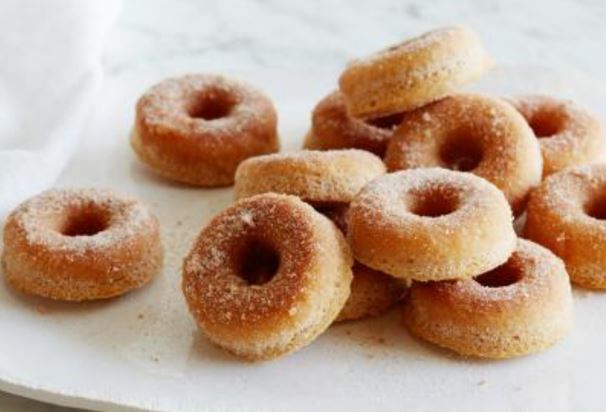 By swapping out wheat flour for almond meal and replacing traditional refined sugar with low-calorie monk-fruit extract, this donut drops the carb count and keeps all the cinnamon-y goodness! Love cinnamon, but not a fan of gluten or animal products? The Big Man’s World created the perfect donut recipe for you! 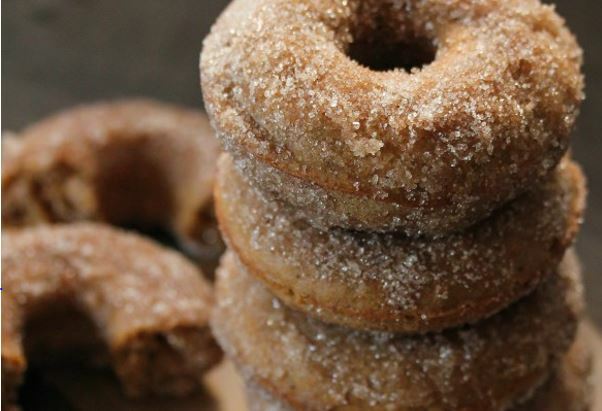 Gluten-free oat flour, almond butter and flaxseed spiked with a healthy dose of cinnamon make for a decadent, cinnamon-y, wheat-free, cruelty-free donut! If you like some spice in your desserts, why not mix it up with a bit more than cinnamon? 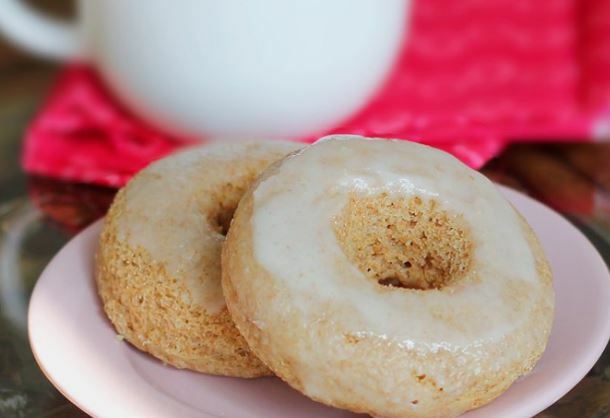 Gingerbread donuts let you mix in extra, zangy doses of ginger, nutmeg and cloves as well! Get a healthy sprinkling of all three of them, and still get that sultry cinnamon you love, in this gingerbread donut recipe from My Whole Food Life! Not a fan of the ginger in gingerbread? Swap it out for cardamom (like Eat Good 4 Life did in this recipe!) and you’ve got yourself a savory chai donut with essentially all the same health benefits and an even more exotic flavor! Crisp breezes, cozy sweaters, freshly squeezed apple cider and warm donuts are fall staples in rural Michigan (where I grew up). If donuts are all wrapped up in autumn memories for you, too, why not really mix the two by adding some fresh, healthy fall flavors straight into the batter! If anything screams “fall” more than donuts, it’s pumpkins. This recipe by My Crazy Good Life uses pumpkin puree and all the spicy goodness of a pumpkin pie (cinnamon, nutmeg, cloves and/or ginger), and contains no processed sugars, wheat flour or dairy products, creating one of the healthiest, fall-y-ist treats imaginable! 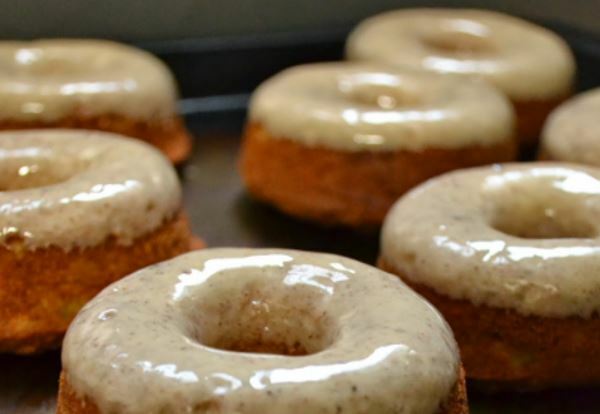 Like the idea of a pumpkin donut, but looking for something fully plant-based? 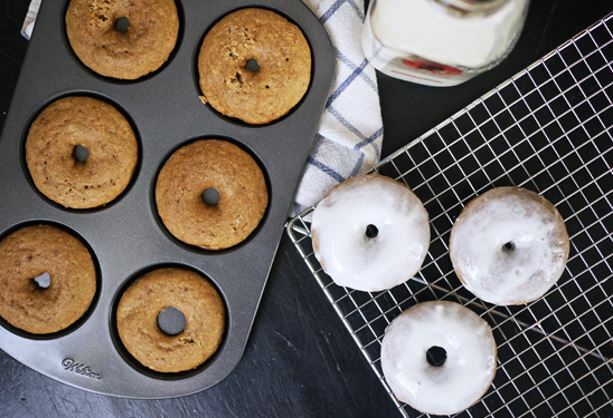 Give these baked pumpkin donuts from Heather Cristo a go! Not only are they vegan, pumpkin-y and pumpkin-pie spicy, they are smothered in a delectable maple syrup glaze! 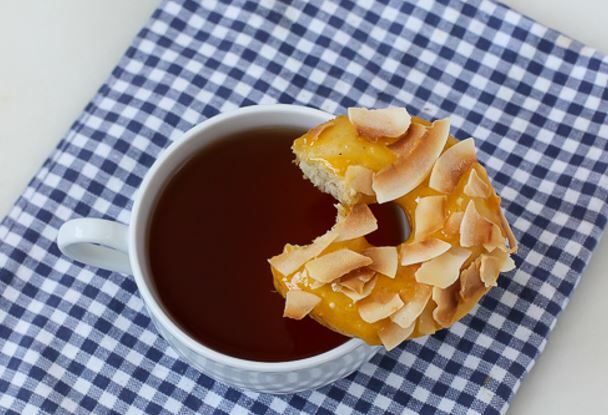 Did you ever wish you didn’t have to just dip your fabulous fall donut in apple cider? Wouldn’t it be better if your donut could be apple cider? Well, except, you know, solid and made of cake. 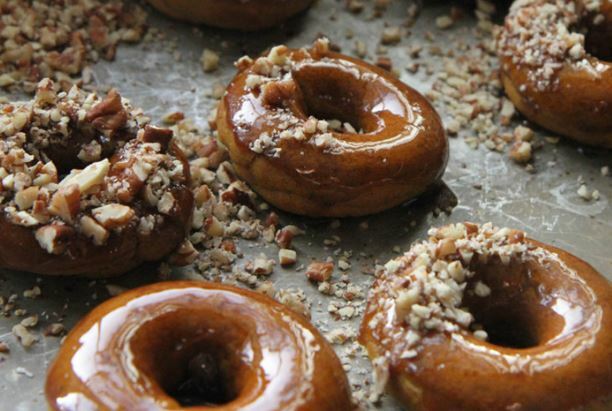 These donuts from Wholefully make that dream a reality! Whole wheat, apple butter, applesauce, cinnamon, cloves and nutmeg combine to make a solid, chewable, apple-cider-y treat! Roasted carrots are the perfect side for any autumn dinner. And shredded carrot is the perfect compliment for a fall donut! 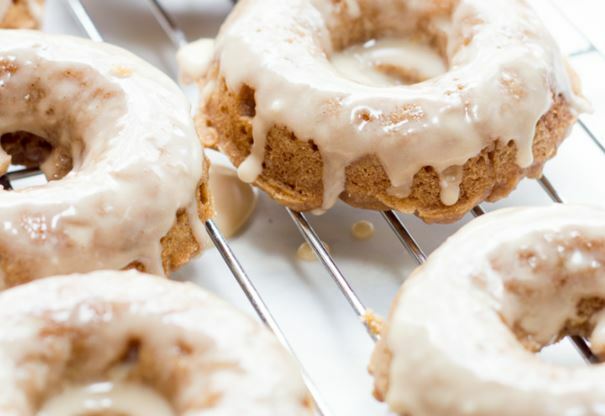 Add a cup of shredded carrot to the batter of these cinnamon-ginger-clove-nutmeg donuts from The Faux Martha to create a fiber-, vitamin A-, vitamin K- and potassium-rich carrot cake delight. Fall-y or not, coffee is a natural donut companion! It lends a balancing richness and bitterness to the sugary sweetness of these hole-y baked goods. Plus, it’s rich in cancer-fighting and brain-boosting vitamins, minerals and phytonutrients that up the health factor along with the flavor! 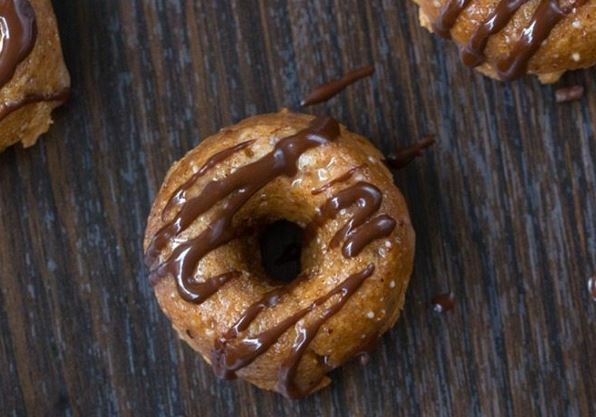 The Minimalist Baker makes great use of coffee’s flavors and health benefits in this fully plant-based, donut-panless, espresso donut hole recipe. I promise, the results are as soul-soothing and addicting as the beverage they’re based on! What donuts would you make if you lived off the grid, grew your own food, and got to pick field- and orchard-ripened produce right from the plant? These ones! 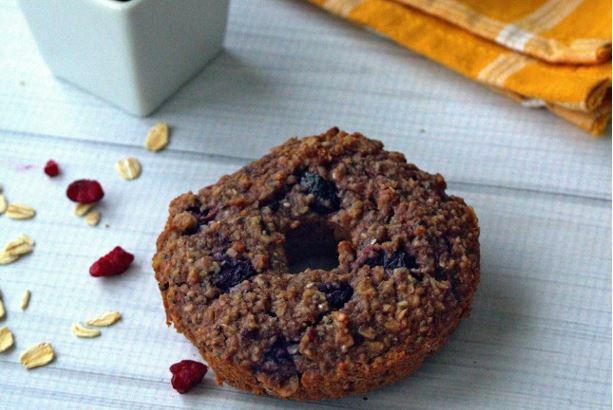 Rich, wholesome heart-healthy oatmeal provides the base for these filling, fruit-and-seed-sweetened donuts from Homemade & Yummy! 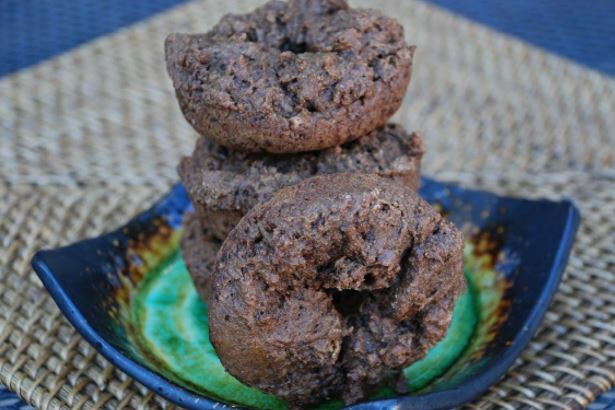 Kind of mix between a donut and a muffin, these are a wonderful, healthy twist on the more traditional, super-sweet donut! This amazing recipe by Just the Woods contains whole oats, coconut flour, frozen berries, chia seeds and almond butter. 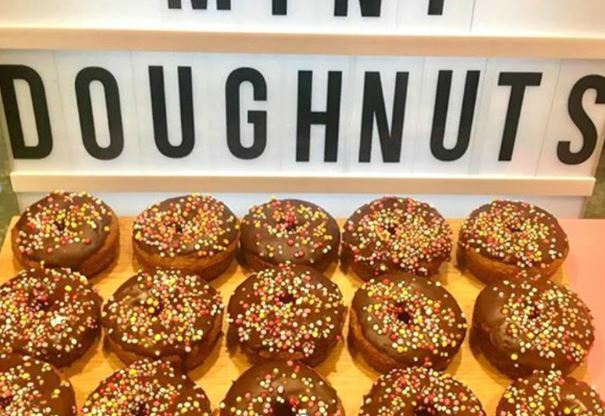 What else could you want in a hearty, satisfyingly-sweet healthy donut? Not in the mood for summer berries? How about combining a whole oat muffin-y base with more fall-flavored shredded pear? 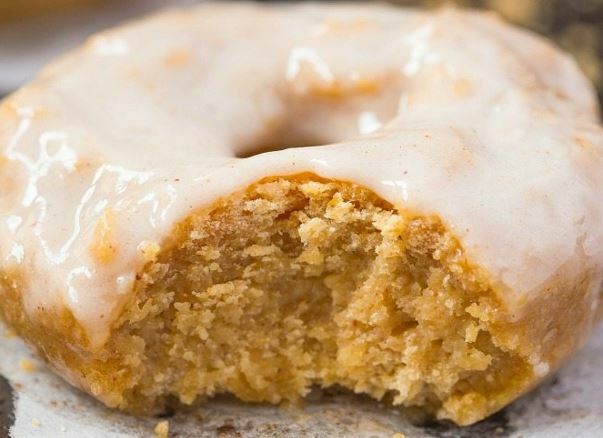 This unique recipe by One Hungry Mama does just that to create a mild, satisfying fiber- and vitamin C-rich donut worthy of dessert, snack or breakfast time! 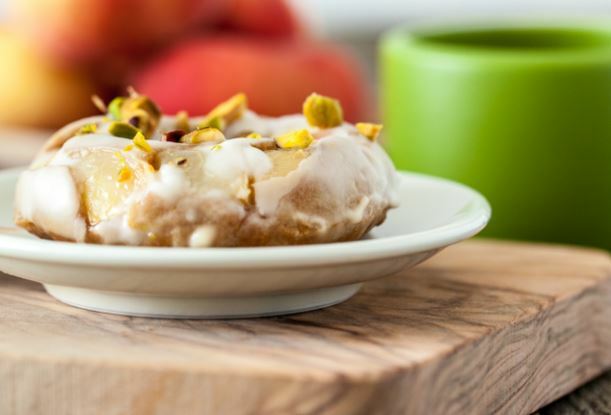 The iconic rustic peaches and cream dessert takes on new life in these delectable donuts by Keepin’ it Kind! 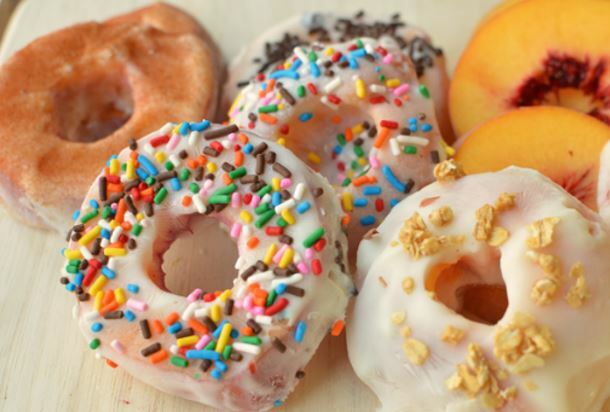 Entirely plant-based with chunks of fresh peaches baked right in, these donuts are a delicious, healthier take on dessert! I cannot get enough fresh berries when summer finally rolls around! This far north, that’s mostly strawberries, but I take what I can get! In fact, my husband and I actually literally mark the calendar for the return of German strawberries every year and celebrate the occasion in the traditional northern German manner: eating pounds of strawberries, daily, for weeks. 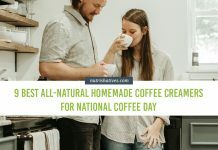 If you’re a berry fiend like me, why not use some of those first batches of early June berries to whip up a batch of healthy, sweet donuts to mark National Donut Day? Zingy and sweet, these blueberry lemon donuts are made super rich and moist by adding thick Greek-style yogurt! Super dense, creamy and berry satisfying (see what I did there? ), you’ll be turning to these blueberry-muffin-like treats time and time again for your donut and blueberry fix! 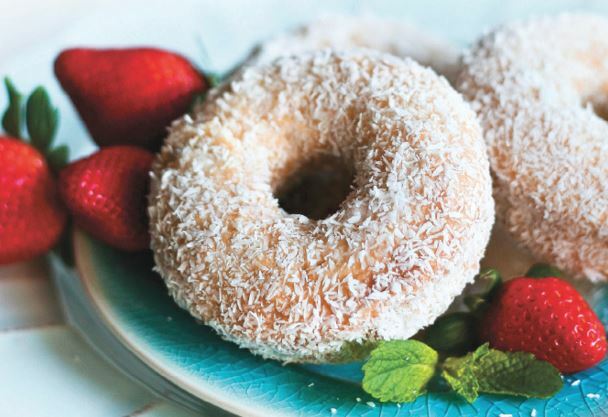 The base of these donuts from Kim’s Cravings is super simple — just flour, sugar, salt, sugar, oil and vanilla — to let all the juicy goodness of the fresh strawberries shine through! 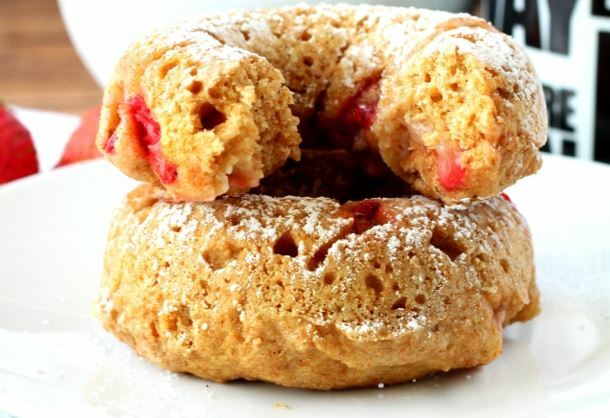 Kind of like strawberry shortcake wrapped up in a portable, cakey ring of goodness, these donuts are an amazing way to cure any donut or strawberry craving! Fresh raspberries aren’t always the easiest to get your hands on and can be pretty expensive at the grocery store. 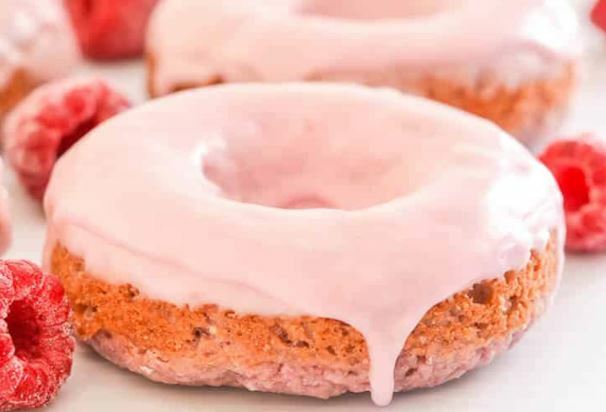 A Virtual Vegan kept that in mind putting together this amazing raspberry donut recipe, calling for frozen berries from the get-go! Simple, fluffy and pink with raspberry goodness, these donuts are a delight for the tongue and the eyes! Lovin’ the thought of a tropical getaway? Warm sunshine, clear white-sand beaches, crystal blue water and all the fresh tropical fruit you can eat. If you didn’t just do a cartoon-like dash after your passport and credit card to book a flight, how about digging into one of these tropical-fruit donuts and letting your taste buds, rather than an airplane, transport you away? Not only is coconut the culinary embodiment of the tropics, it’s packed with all kinds of healthy nutrients. 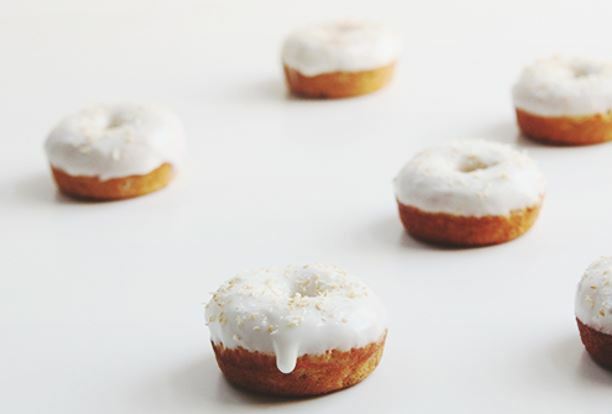 These donuts from Pure Ella let coconut shine, using coconut milk, coconut oil, and coconut flakes! They’re like a vacation for your mouth! If coconut alone isn’t enough of a tropical feel for you, combine it with mango! This delectable duo not only tastes like sunshine, adding the mango adds a whole slew of extra health-promoting phytonutrients as well! Chez Catey Lou has you mix mango puree straight in the donut batter and top it off with unsweetened coconut flakes to create a donut dream! Pineapple smacks of beachy vacations. 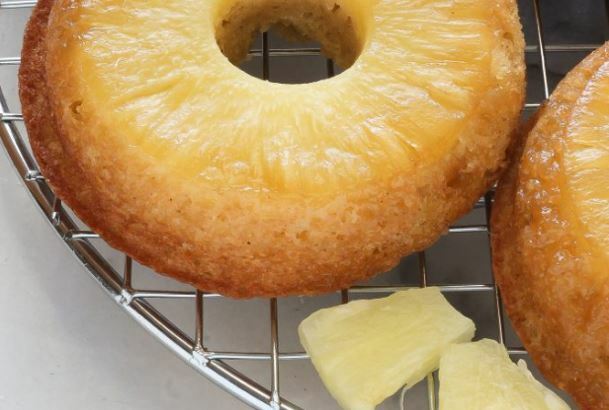 And these pineapple upside down donuts from Baker by Nature are just the kind of decadent indulgence you would eat on an actual vacation! Pineapple-juice infused batter layered with a whole slice of fresh pineapple and sprinkled with brown sugar to create a caramel glaze as the donuts bake — these donuts take the sweet, gooey, tropical cake! Perhaps a bit less exotic than pineapple, coconut or mango, oranges are nevertheless a tropical fruit! The Little Epicurean has you mix the zesty, citrus-y flavor of oranges with some zippy poppy seeds to create a unique, sunshiney, scrumptious dessert! Okay, I’ll admit it. I’m playing kind of fast and loose with the concept of a “donut” here. 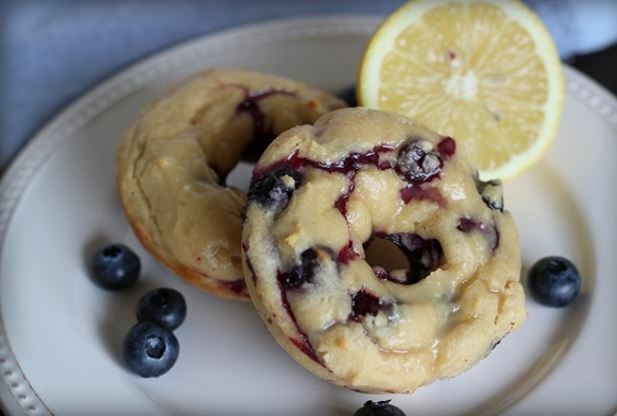 But, if you are aiming for healthy, these three “donut” recipes cannot be beat! What’s round, sweet and dripping with a gooey glaze? A frozen peach slice dipped in yogurt, of course! Top with sprinkles, cinnamon sugar, or nuts, as recipe creator Super Healthy Kids did, and you’ve got the healthiest “donut” on the planet! Once you wrap your brain around the concept of an entirely fruit donut, it’s easy to expand from peaches to any other round fruit you can think of! I like the apple options created by Laura Fuentes! Apples are sturdier than peaches, so there is no need to freeze them for this recipe. 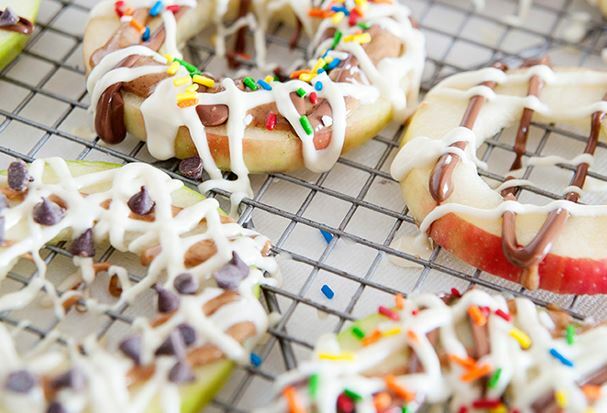 And apples open up some topping options that wouldn’t work great with peaches: like chocolate or nut butters! Don’t like peaches or apples? Don’t have any other donut-shaped fruit around? Here’s a creative way around that: freeze any ol’ fruit into a donut shaped piece of ice! 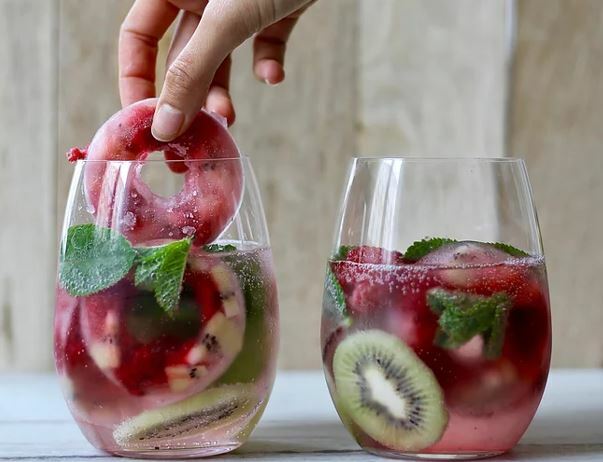 Creator Two Spoons used cherries, kiwi and berries, but any smaller fruits or chunks of fruits will work! Then drop in your favorite drink for a festive flash of color, fruit juice flavoring and, when the “donut” melts, some tasty fruit morsels! Don’t have much of a sweet tooth and don’t actually really like all the sweet gooey goodness that is a traditional donut? I’m not entirely sure why you’re reading this article, but I’m very impressed you’ve stuck with me all the way to the end! Here are two non-traditional, completely unsweet donut recipes for you, too, so you don’t feel left out! Fresh, flavorful, herbal — sun dried tomatoes and basil make any dish a delight! 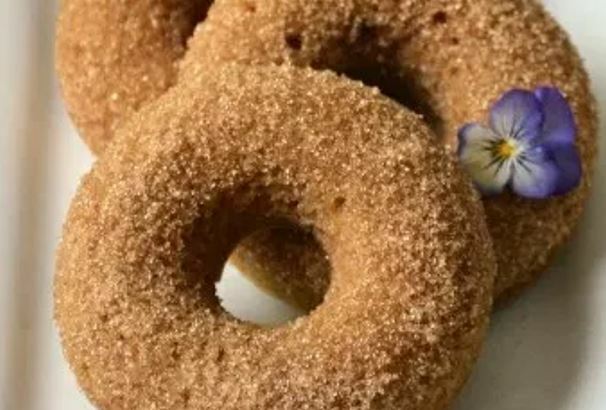 Mix them into the dense, bread-y goodness of Anne Travel Foodie’s vegan donut and you have yourself a seriously savory treat perfect for brunch! Love everything bagels? Why not mix all those delicious flavors into the fluffier donut form? 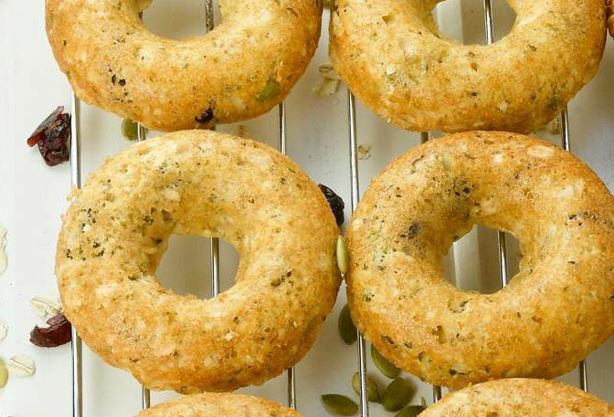 No Thanks to Cake gives you all the know-how you need to make this fun bagel-donut crossover and satisfy all your onion-garlic-seed-salt-donut cravings! There you have it! A full 40 healthified donuts that can feed your inner child and your healthy body! 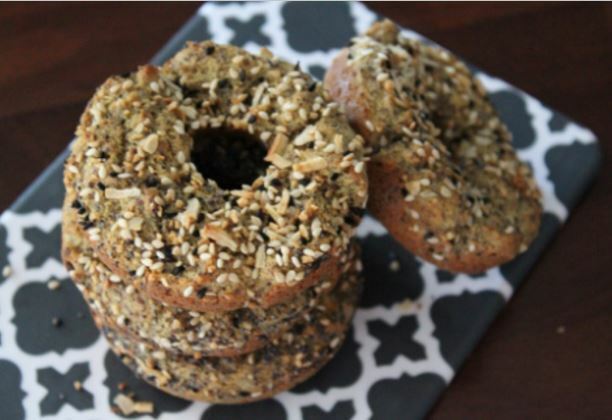 Did you find your perfect healthy donut recipe on the list? Let us know in the comment section below! And don’t forget to SUBSCRIBE for more healthy recipe lists like these! Some tasty options!! Thanks for the round up! Thank you so much, Tessa! And thanks for coming up with such a great recipe! Oh how I wish a bakery existed where I could walk in an order a box of these assorted donuts!! HEALTHY donuts are the best. Love when you can have a NO GUUILT treat. Thanks so much for including my Baked Oatmeal Donuts in this great collection. I have shared and pinned.